Close Combat III: The Russian Front , Atomic Games, 1998. 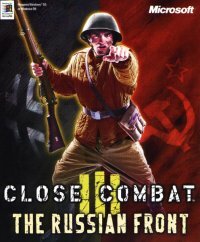 Following is a brief review of "Close Combat III: The Russian Front," the third computer/board/strategy game in a series from Atomic and Microsoft Games. What sets this game apart other World War II games is the modeling of the fear and morale of the men. It has been said that in W.W.II, a relatively small percentage of a battle consisted of firing weapons. A large percent of the battle was finding good cover, running and hiding, and waiting for the enemy to blow his cover. This computer game models those notions well. The game is played on an overhead view of the terrain. You can play a single battle, an operation that links up to 5 battles, and a campaign that links 30 to 40 operations. In between battles you get a number of requisition points to refit or request new units. There are leader, infantry, armor, and support units. Most games consist of 10 to 15 units versus a similar sized opponent. The game bears a striking resemblance to Avalon Hill's "Squad Leader." 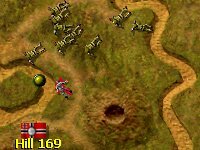 The computer game exceed the board game in its ability to hide the enemy units, and keep track of all the minutiae of the battle. The computer game also excels in atmosphere with authentic weapon noises and screams and yells in English, German, and Russian. Our favorite sound is the audio cue that a man is breaking and running from combat, he yells, "The Blood!" On the other hand, the screen real estate is limited, so the board game typically had more units over a wider area. Both versions are "scenario" based. Both versions have an incredible amount of detail and research encoded in the game. Paul and I, being the big W.W.II aficionados we are, bought the game immediately upon its release. We practiced a few games against the rather weak computer opponents, and then we met for internet combat. Last night we played an operation "Moscow Retaliates" an early war scenario in which the Russians overwhelm and counter attack the Germans. In the first battle I had 10 veteran squads of high morale. The Russians attack with an overwhelming force including 3 T-34 tanks. Without anti tank weapons I could do no harm as the tanks rolled forward. I attempted to rush and destroy a few tanks in close combat to no avail, I guess those sticky bombs don't work in the frigid snow. After losing 5 of 10 squads I fled the battle field and lost another 9 men (a penalty for chickening out). Onto the second battle. Because of my poor performance in the first battle I couldn't refit or requisition additional squads. However, I did buy a 76 mm and a 50 mm anti tank gun and crews. Once again the Russian tanks rumbled forward and quickly occupied all victory locations. The countdown timer began its "2 minutes to defeat" warning. Then, a quirk of America Online, Paul's ISP, came to the rescue. They have a program that checks user activity and boots off inactive users at the top of the hour. Thanks to AOL the Russians were disconnected, and Paul and I had to replay the battle. After seeing his units the first time, I was able to more effectively ambush his forces. The 76 mm and 50 mm guns successfully picked off the 3 T-34s on the second time around. For the third and final battle of this operation I was able to purchase a light Panzer II tank, a second leader to help rally the troops, and a few more squads. The Russians bought a few more tanks also. I set up my ambushes and waited for the overwhelming Russian attack to come. One German machine gun crew of 3 crawled east through the woods and met face-to-face with a Russian squad of 10 crawling west. The surprise battle ended with one German machine gunner and lots of bloody bodies. An alerted Soviet tank dropped a 76 mm round and the machine gunner was history. My light Panzer II tank acted on its own initiative and advanced across a snowy field. A single shot from a T-34 connected and ended that tank's life. The battle ended and the Russians celebrated and overwhelming victory. The game works well, but there are many areas in which it can be improved. First of all the rosters are extremely limited. I would like to be able to control many more squads and tanks, but the game limits you to 12 to 15. Secondly, each unit can have a bar to display its morale, ammo, or other statistics, but you cannot switch this during the battle, only through an offline option menu. The game takes advantage of larger computer screens up to a point. Although a larger area of the battlefield is visible, the fonts and controls are not expanded to make a more readable display. The rulebook, although brief and to the point, omits much needed explanation of the user interface. I'm still not able to read and understand some of the doodads in the battlefield display. We both had trouble making the Requisition screen do what we wanted. Lastly, the game is a two player game only. There can be no spectators or division of command of either of the forces. Despite these shortcomings, both of us enjoyed the evening of internet computer gaming and met with a phone call for a detailed post-mortem. Unlike the buggy Close Combat II which never worked for us over the internet, Close Combat III performed flawlessly and without delays -- quite impressive when you consider that I hosted the game from my 166 MHz Pentium laptop and a 28,800 baud modem. We both were flushed with excitement over the battles, and we reminisced about our Junior High and High School days were we would spend an entire Saturday setting up the boards and the counters for Squad Leader. This computer game is all the enjoyment and excitement of that board game, plus a whole lot more sights and sounds and lot less rules haggling and bookkeeping. I recommend this computer game for any board gaming strategist who is interested in the World War II genre. [an error occurred while processing this directive] Last modified: Thursday, 09-Jun-2011 12:36:42 MST.